For those of you asking me about Shakeology, here is a great you tube that explains it, and shows you what goes into Shakeology. It really does become your healthiest meal of your day because of the 70 organic Superfoods it contains (you can’t juice that every day), is Soy, Dairy, and Gluten Free and contains ZERO added sugars or preservatives…you can’t find a shake like that at your local health store. It isn’t just a protein, or weight loss shake, but an overall HEALTH shake. This is easy and quick to prepare for a breakfast which is the most important meal of the day. As you can see from the chart below, it will give you energy and a good start to your day. The majority of the people in my monthly groups drink Shakeo. Just yesterday I had one friend who dropped her glucose level from 205 to 124 JUST because she started drinking it. Another who has lost 86 pounds, and another who is off her cholesterol meds…all due to Shakeology! If you want more info, or would like samples, please let me know. 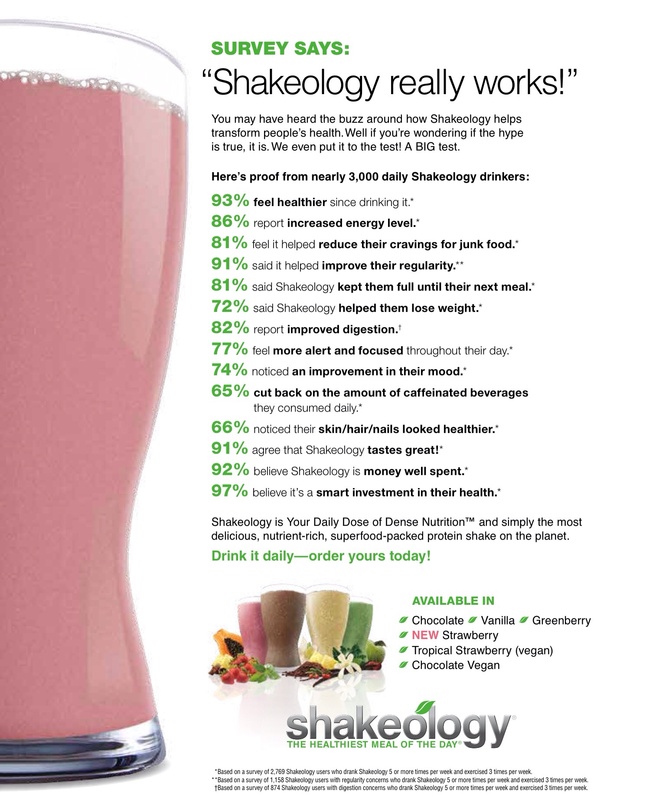 Thank you for your interest in shakeology. I hope you will consider me as one of your health care advocates.